To celebrate the release of The Walking Dead: The Complete Seventh Season on Blu-ray and DVD today, we’ve got 2 full DVD sets to giveaway! AMC’s smash hit THE WALKING DEAD returns with its most shocking season to date as Negan’s savage rule forces the residents of Alexandria to their emotional and physical limits. THE WALKING DEAD: THE COMPLETE SEVENTH SEASON on DVD and Blu-ray™ includes over two hours of featurettes plus over four hours of audio commentary and deleted scenes. THE WALKING DEAD: THE COMPLETE SEVENTH SEASON sees the return of cast favourites; Andrew Lincoln as Alexandria’s reluctant hero, Rick Grimes; Jeffrey Dean Morgan as the leader of the brutal Saviours, Negan; Chandler Riggs as Rick’s son, Carl Grimes; Noman Reedus , as crossbow-wielding Daryl Dixon; Melissa McBride as Carol Peletier who secludes herself from Alexandria after she is forced to question her ruthless methods; Lauren Cohan as survivor Maggie Greene; Danai Gurira as katana-wielding warrior, Michonne; Sonequa Martin-Green as former firefighter, Sasha Williams; and Tom Payne as Paul “Jesus” Rovia, recruiter and a supply runner for the Hilltop Colony. This season also introduces a fan favourite comic book character; The Kingdom Ruler Ezekiel, played by Khary Payton with his pet Bengal tiger, Shiva. For a chance to win a DVD copy enter via our competition app below! 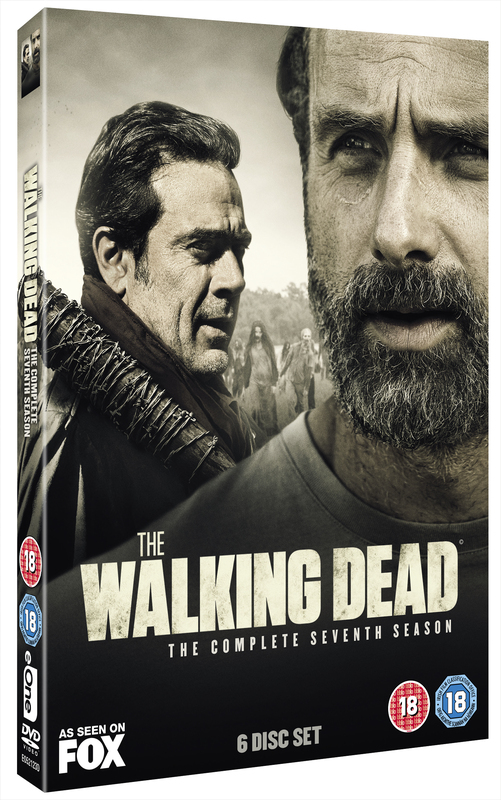 The Walking Dead: The Complete Seventh Season is available now on Blu-ray™ and DVD, courtesy of Entertainment One. The competition ends at 23:59 on 9 October 2017. The prize consists of a The Walking Dead: The Complete Seventh Season DVD.